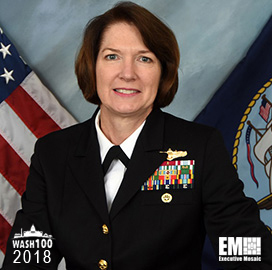 Executive Mosaic is honored to announce that Vice Admiral Nancy Norton, recently-promoted director of the Defense Information Systems Agency and commander of the Joint Force Headquarters-Department of Defense Information Network (JFHQ-DODIN) has been added into the 2018 edition of the Wash100 — Executive Mosaic’s annual selection of the most influential voices in the government contracting arena–for her efforts in creating an agile workforce to meet changing requirements for warfighters and ensuring the lethality and dominance of the American national security. It is VADM Norton’s belief that war-fighters should have the information and (cyber) tools they need to succeed on the battlefield, putting value on the mission assurance and information technologies that are maneuverable, mobile and quick to manufacture. As DISA is making progress, time and efficiency are sometimes set back by engineering hurdles. She cites an example from when she served as the commander of a Naval telecommunications station in Bahrain from 2004 to 2005, her unit tasked to work with DISA Central Field Command to restore circuits. Consistently providing crucial communication capabilities to troops in-theater, Norton is one of many working to maintain America’s international clout throughout the ongoing process of collaborating with our nation’s military to improving national security in cybersecurity. Executive Mosaic congratulates Vice Admiral Nancy Norton for being selected to receive this award.